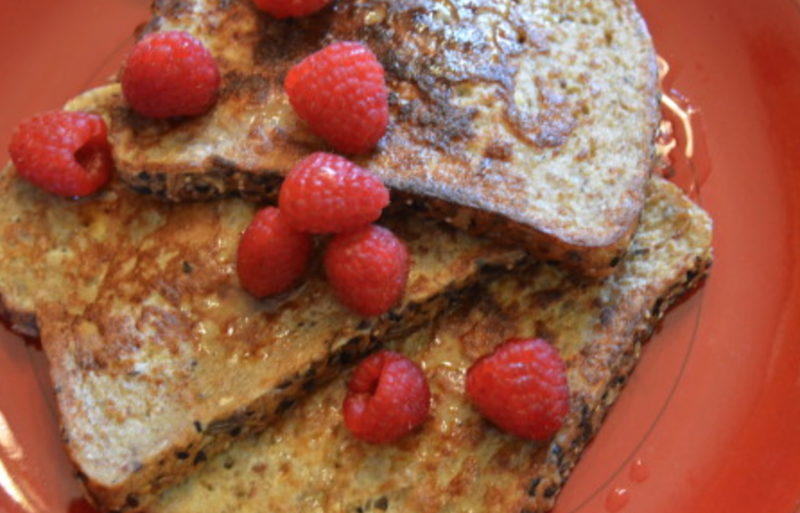 Who doesn't love a good breakfast of French Toast? This one uses all clean ingredients and tastes great! Enjoy! Put egg whites, vanilla, only 1/8 cup of the orange juice, cinnamon and rice milk in a bowl and whisk until well combined. Add bread to bowl one at a time and coat well. Add bread to a nonstick pan, heat over medium. Turn when browned. In a separate pan, add berries, 1/2 scoop of stevia (optional) and 2 tablespoons of orange juice. Heat on low. When toast is complete and "syrup" is warm, serve 1 slice and enjoy! Save the other 2 for snacks and/or tomorrow's breakfast.